Click each seminar title below to view a full description and detailed outline. A large portion of the seminar addresses the use of options theory to trade the more popular option strategies. These theories include the application of implied volatility, volatility skews, expected return, and risk management. The strategies covered in this regard include covered writing, naked put selling, credit spreads, calendars spreads, ratio spreads, backspreads, and straddle buying. The use of weekly options in some of these strategies can make them highly profitable. 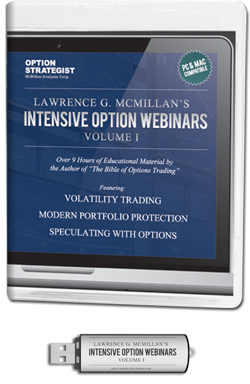 This 4 hour intensive webinar includes an array of highly profitable, successfully tested trading systems. Some of these are day-trading systems, including the powerful Previous Daily Range system, while others are of a longer term. The power of the content in this discussion alone makes the webinar worthwhile. In addition, index option strategies for protecting entire portfolios would include hedges using stock-based indices, such as the S&P 500 (SPX) options, as well as volatility protective strategies, using VIX or VXX options. Portfolio protection techniques will also demonstrate how to relate your personal stock portfolio's volatility characteristics to those of the available heding indices. Included in the portfolio protection techniques will be a discussion of available products in the newest asset trading class—volatility—including futures, options, ETNs, and ETFs. You will learn about the advantage of "blended" ETFs (ones with protection already built in), such as the CBOE's Tail Hedge Index or Barclay's VEQTOR ETN. In addition, as is always the case with McMillan seminars, we will divulge and update our highly profitable trading systems, including the Previous Daily Range system. This will include the timely "January Seasonal" strategy, which can be implemented shortly after the seminar takes place. The power of the content in this portion of the seminar alone makes the seminar worthwhile. Purchasers of this set will not receive the complimentary bonus materials mentioned in seminars. PC: WMV video file for use with Windows Media Player on Windows® 2000, XP Home, XP Pro, 2003 Server, Vista, Windows 7, Windows 8. Mac: MOV video file for use with Quicktime and iTunes on Mac OS® X 10.4 (Tiger®) or newer. Note: To play MOV file on iPad, iPod or iPhone, transfer file to your computer first and then synch to your device through iTunes. WMV file will not play on iPad, iPod or iPhone unless converted to another format first.